LP Maine Pointe In The Press| Digital Supply Chain| You Need To Change But How? 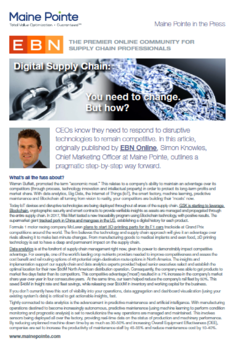 Digital Supply Chain: You need to change, but how? CEOs know they need to respond to disruptive technologies to remain competitive. In this article, originally published by EBN Online, Simon Knowles, Chief Marketing Officer at Maine Pointe, outlines a pragmatic step-by-step way forward.